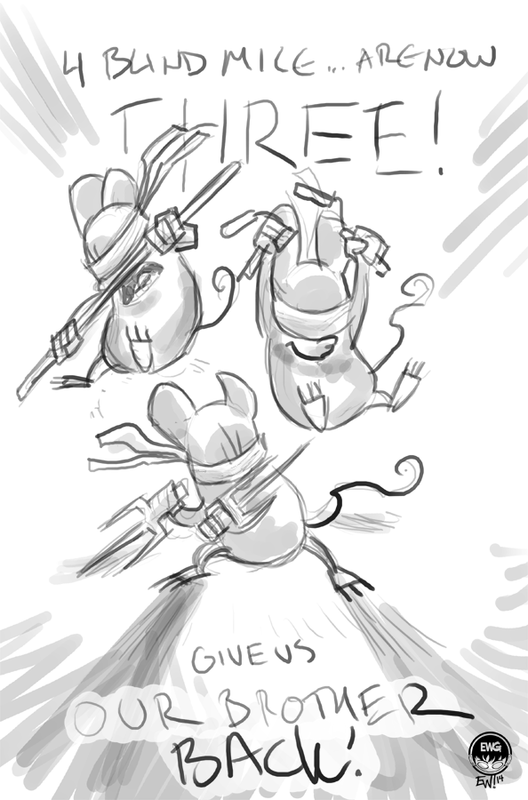 #3BLINDMICE for #sketch_dailies 10 minute warmup this morning. Originaly tried to do it in 5 but had to darken it up/ go over it a bit more and so added another 5 min and then ended up with enough time to throw in some shade/ wording. Hehe - look at that. 5 extra minutes and now you have BACKSTORY. A good warmup, gets the mind criticaly thinking in a creative way, lets me draw loosely with no focus on perfectio nor exact design of the mice. Just something whimsicle and off the wall. Theese is a product o' how my brain works here lol. Three blind mice equals automatic teenage mutant ninja turtles reference - apparently! 10 min, all photoshop w/ brush tool setup to look like pencil for the sketching and then as ink wash for the shading.